Imagine yourself waking up inside a sleeping tube twenty-two years after being frozen in deep sleep inside a medical facility. You awake to a world even more terrifying than your worst nightmare -- a world where human beings are hunted down by monsters like nothing more than tiny insects. Welcome to Earth in year 2031, a time when the planet is no longer ours. For Kaidou Yuuji, that nightmare became reality the moment he woke up, awakened by a mobile assult team on a mission to retrieve any remaining 'sleepers' in the medical facility ('Sleepers' are people such as Yuuji himself, who had been misled by their doctors to believe that they all had an uncurable illness and has to be put to deep sleep until the time when a cure can be found in the future). Refusing to accept the reality before him, Yuuji struggles to figure out what had happened while he was asleep and to recover his will to stay alive, by living through close calls from the seemingly endless attacks by the monsters refered to as "Blue". Luckily for Yuuji, he is not without the help of the mysterious mecha pilot Marin; who's voice actress was also the one behind the wonderful theme songs used in the opening and the ending sequences, "Toki hanate!" and "Ai ga Oshietekureta" - Kuwashima Noriko. 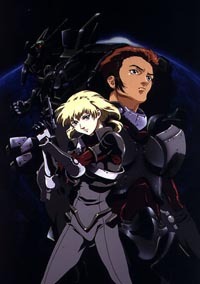 First aired early October in 1999, the 26 episode "Blue Gender" series probably reminds most people of the movie Starship Troopers in a sense, anime style. With a little twist -- this time the battle field isn't some planet far away, but Earth itself. And guess what -- this time, the monsters won the fight. Instead of the typical "good guys always win" stereotype, the storyline of Blue Gender begins with a glance of the harsh life people have to endure after losing their own planet to the powerful creatures, and their fight to take back their home planet. To emphasize the life our heroes in this series have to live by every single day, there's more violence and death added than most other anime series in general. So, for those of you who doesn't have a stronge stomach for blood or cruelty, better stay away from this series. BUT, if you are a big Science Fiction fan like myself, and love anime series with lots of mechas and battles, this is most definitly a series you won't want to miss. A top-notch science fiction story with excellent character and mechanical designs.